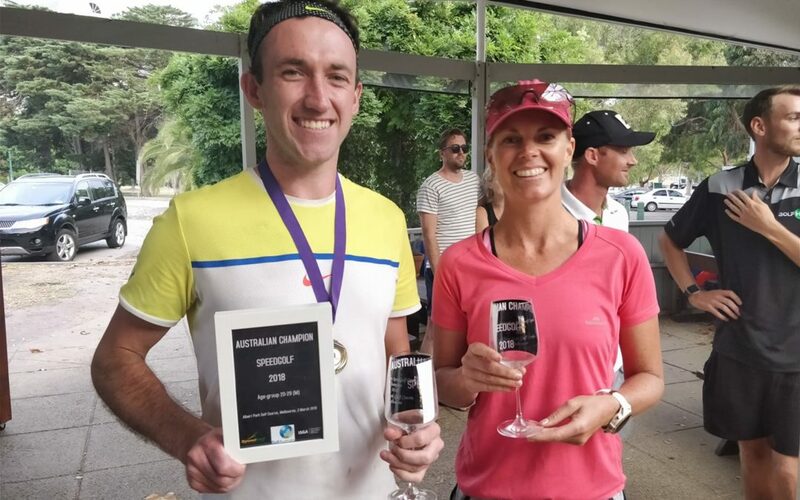 With the Australian Grand Prix track providing a fitting backdrop, Lee McCullagh and Liz McKinnon showed the precision, pace, poise, and driving ability that will be required to win the upcoming race to take out the men’s and women’s titles at the 2018 Australian Speedgolf Open at Albert Park Golf Course at the Australian Speedgolf Open. 29-year-old McCullagh, a two-handicapper from Bendigo in Victoria with a 5km PB of 16 minutes, shot 80 in 47 minutes and 26 seconds despite the hot, windy conditions in Melbourne. This score narrowly edged out Richard Olsen, the 2016 New Zealand Speedgolf Open champion and former elite 1500m runner. Remarkably, this was McCullagh’s first speedgolf event. One suspects it may not be his last. New Zealand went one better in the women’s event, which saw former Ladies European Tour professional Liz McKinnon record a massive PB en route to victory. She navigated the challenging conditions beautifully to record a round of 77 in 51:32. Liz plays speedgolf regularly at Remuera Golf Club, where New Zealand Golf is now based, and is seeing the sport growing across the ditch. PGA professional James McMaster from Drummond Golf in Canberra finished a creditable fifth – shooting 79 in 52:13 in a round that included two chip-ins in his very first Speedgolf tournament – one to watch for sure for the future!